NASHVILLE, Tenn. – Over the course of the next four days, I’ll give out four midseason awards for defensive rookie of the year, offensive rookie of the year, defensive player of the year and offensive player of the year. 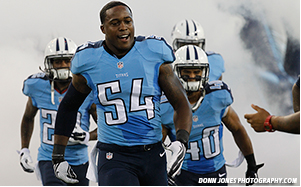 We’ll start this series with the Titans top defensive rookie this season -- Avery Williamson. The inside linebacker out of Kentucky is an easy choice for the award and he’s arguably been the team’s best defensive player since being thrust into the starting lineup in Week 5 against the Browns. In his four starts, Williamson has recorded 25 total tackles, including his best game as a pro last week against Houston when he led the Titans with 10 tackles and logged his first career quarterback sack. Williamson also recovered a fumble in back-to-back games against the Jaguars and Redskins. The first came deep in Titans territory when Jason McCourty hit the ball out of Ceceil Shorts’ hands with Williamson recovering it and running it back 41 yards to midfield. The turnover kept the Jaguars away from sure points and helped seal Tennessee’s second win of the season. The very next week against the Redskins, Williamson was ‘Johnny on the Spot’ when Derrick Morgan sacked Kirk Cousins and knocked the ball loose. The fumble came straight into the awaiting arms of Williamson. In his weekly press conference on Monday, head coach Ken Whisenhunt went out of his way to commend Williamson’s growth as a player and impact on the team. He was asked about Taylor Lewan and Zach Mettenberger providing a boost for the team and Whisenhunt added Williamson to the list. The Titans selected Williamson in the fifth round of the 2014 NFL draft with the 151st overall selection. The linebacker finished his four-year career at Kentucky with 296 total tackles, 10 tackles for loss, four sacks, two interceptions and three forced fumbles. Titans rookie Avery Williamson (54) tracked down the Texans' Arian Foster. Former University of Kentucky star Avery Williamson had a career-high and team-best 10 tackles, including his first quarterback sack, in the Tennessee Titans' 30-16 loss to the Houston Texans. Eight of the rookie linebacker's tackles were solo and two were for a loss. "I'm getting more comfortable and that's a part of it," he said. "I feel like I'm playing pretty good. We have to keep our head on straight and keep on working, and I feel like it is going to get better for me. The better I do, the more it helps the defense out." Teammate and fellow ex-Cat Wesley Woodyard added six tackles and two of those were for a loss. And former Paducah Tilghman standout George Wilson had three tackles for the Titans. "I like the fact that we were good at getting pressure on them early," Titans Coach Ken Whisenhunt said of his defense. "I appreciate the fight in our guys. Nobody quit, nobody gave up." Rams tight end Lance Kendricks made his only catch Sunday against the Chiefs count, as he recorded his fourth touchdown of the season. He now has a touchdown in three straight games. Kendricks finished off the team's opening drive with a 1-yard touchdown reception. It gave St. Louis its only lead of the game as Kansas City rallied for a 34-7 win. The four touchdowns ties a career high, which Kendricks managed in the previous two seasons. The Rams are back in action Week 9 at San Francisco. 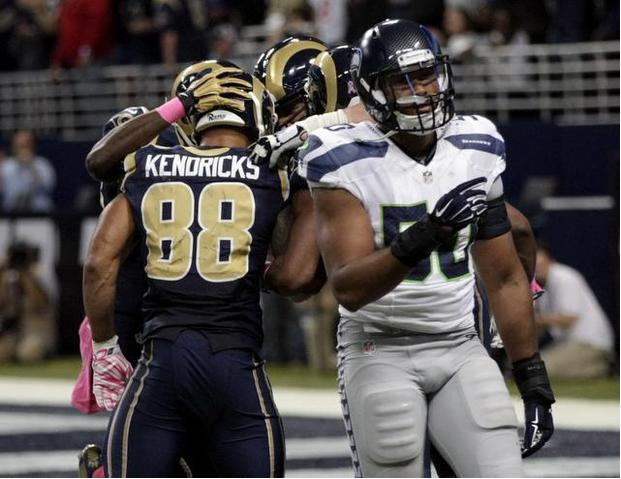 St. Louis Rams tight end Lance Kendricks, left, is congratulated after scoring on a 4-yard touchdown catch as Seattle Seahawks linebacker K.J. Wright, right, walks away during the fourth quarter of an NFL football game Sunday, Oct. 19, 2014, in St. Louis. The Rams won 28-26. Rams tight end Lance Kendricks found the end zone for the third time in the last four games in the 28-26 win over the Seahawks. With St. Louis clinging to a 2-point lead in the fourth quarter, Austin Davis hit Kendricks for a 4-yard touchdown that proved to be the difference. Kendricks finished with two catches on three targets for 17 yards. He'll visit Kansas City in Week 8. OWINGS MILLS, Md. -- The Baltimore Ravens media requested to speak to guard Marshal Yanda this week, and you could tell the three-time Pro Bowl lineman wasn't thrilled about stepping to the podium. “I’m just here to answer your guys’ questions, and that’s about it -- pretty vanilla out of me," he said. Yanda is your typical offensive lineman in that way. He prefers to be part of a unit and not in the spotlight. But Yanda is far from your typical offensive lineman in every other way. In fact, he's the NFL's top-rated lineman in Pro Football Focus' rankings after six weeks into the season. It's not even close. Yanda has earned a 16.9 rating and no other lineman has one over 13.8. He's allowed only one sack but his strength is run blocking. Yanda is known for pushing the linemen in front of him out of the play and then getting to the second level. Yanda is one of the most respected players on the team, and that comes from his commitment to the team. In 2012, he needed emergency surgery on his right leg after a game on Christmas Eve. A leg whip to his lower leg, close to his calf, caused Yanda to develop compartment syndrome, which is a compression of nerves, blood vessels and muscle in a section of the body. But, a week later, Yanda was back on the field, delivering a key block on a touchdown run. It's not exactly Michael Jordan leaving the NBA for baseball, but don't tell that to Australia. You've probably never heard of Jarryd Hayne, and that's alright, because he's been previously plying his trade on the other side of the world. Even in the age of the internet, his talents might have escaped you. But make no mistake: He's one of the best athletes you'll ever see, and he's coming to America, apparently with the intent of playing in the NFL. Why is Hayne's arrival a big deal? 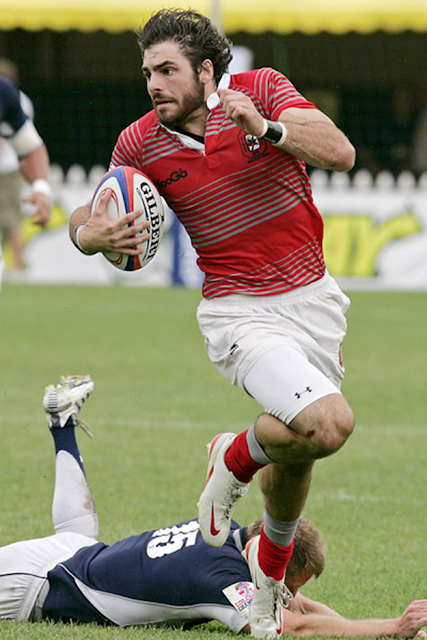 He's one of the best rugby players in the world, and is electing to quit his sport at the top of his game to pursue a dream of playing football that is by no means certain. Where does this sound vaguely familiar? It's actually very similar to Michael Jordan's story. Hayne is legitimately bored with the sport that has made him so famous, and wants a new challenge. This "challenge" (which was baseball in Jordan's case), is a decidedly lofty one. As Jordan proved, even a once-in-a-lifetime athlete struggles in a new environment. Hayne will seemingly have an easier transition, since he's still doing roughly the same type of thing: Evading tacklers while running with a ball. That said, there are numerous differences between the two sports, starting with the type of hitting, and the cumbersome pads that he'll have to wear. Not to mention the ridiculously complicated playbooks. Still, Hayne has received endorsements from NFL players, like Lions running back, Reggie Bush. He explained his decision in an open letter to Australian fans, and in his press conference earlier on Wednesday, Hayne expressed his thoughts on leaving the sport of rugby, and also his excitement for the football dream. Where Hayne will sign in the NFL is another question. Many are already pointing at the Seahawks, who Hayne visited last month. That's not a done deal, however, and he could very well end up in another uniform, due to the fact that Seattle is already set at the kick return position (with Percy Harvin), and that's a position that might prove most natural for Hayne right away. Who could use a kick returner? Obviously, the New England Patriots. Devoid of a consistent, quality returner, Hayne would be a great fit in sports-crazed New England. Fans would most likely take to a player known for his blend of skill and toughness. If he decided to play running back, it might also cover a whole left by the Stevan Ridley injury, but let's not get ahead of ourselves (that would be a tough ask for a rookie with zero football experience). More likely than not, he won't become a star in one of the most physically demanding leagues in the world. But we don't know that yet, and this is clearly an exciting story (it's creating headlines like this in Australia). Keep an eye on where Hayne ends up, and don't be too shocked if the cap-friendly Patriots at least show some interest. One offensive play, one touchdown. That's the NFL track record for defensive lineman Karl Klug following the Titans' 16-14 victory over the Jaguars on Sunday. Klug, who hadn't played running back since his senior year of high school, entered the game as a fullback with the Titans facing a first-and-goal at the Jacksonville 1. With Klug helping open up a hole, Jackie Battle rumbled into the end zone for the Titans' only touchdown of the day. "It was pretty cool," the fourth-year pro said. "I was telling the guys it brought back the glory days of high school." Klug isn't exactly sure how he was recruited to play fullback, but he has a hunch that defensive coordinator Ray Horton "looked at my background and saw that I played running back in high school." Klug's reaction when running backs coach Sylvester Croom told him he was going to be in the backfield? "I'm like, 'Sweet.' "
How did he feel things went on the play, which also featured a couple of extra offensive linemen in Byron Stingily and Chris Spencer? "It went good enough," Klug said. "We got a touchdown and that was pretty cool." There were some concerns about the quality of the playing field heading into the inaugural season at Levi’s Stadium in Santa Clara, but kicker Phil Dawson seems to be finding things to his liking. Dawson has made all 11 of the field goals he’s tried at the 49ers’ new home this season, including nine in back-to-back wins over the Eagles and Chiefs over the last two weeks. Five of those came against Kansas City in Week Five, which led to Dawson being named the NFC special teams player of the week on Wednesday. Dawson hit field goals from 27, 30, 31, 52 and 55 yards during the game and added an extra point, which accounted for 16 of the points that the 49ers scored in a 22-17 victory. It’s the fifth time that Dawson has received weekly special teams honors and the third time he’s done it as a member of the 49ers. His win comes a week after 49ers safety Antoine Bethea was named the conference’s defensive player of the week.